My name is Nathan Dunn and I represent Florida Family Action. We are associated nationally with Focus on the Family and we represent the interests of millions of Floridians who wish to see traditional values and the interests of families represented in matters of public policy. I want to briefly state that we are opposed to any agreement with the Seminole Indians that will expand predatory gambling in Florida. The introduction of Class III gambling to Seminole facilities is not in the best long-term interests of Florida’s families and communities. The compact was put together under the assumption that the federal government would authorize Class III gaming for the Seminoles regardless of what the state did. And the popular idea was put forward that agreeing to the Compact at least allowed the state to benefit some financially from this supposedly inevitable expansion of gambling. We take issue with the very foundation of that premise. In 2007 the state of Texas successfully rebuffed an effort by the US Department of the Interior to force Class III gambling upon the communities of Texas. The 5th Circuit Court of Appeals ruled that the Interior Department overstepped its bounds and violated the Indian Gaming Regulatory Act by authorizing the Kickapoo Tribe to begin Class III gambling (1). In so doing the court upheld the right of states to limit the gambling offered on Indian property in their state. 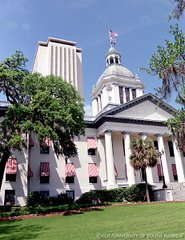 Thus the state of Florida has solid legal ground to reject a compact with the Seminole Indians and there are significant reasons why expanding predatory gambling is the wrong direction for the state to take. The results across the board are devastating to families and communities and can be summed up in the ABC’s of gambling: Addiction, Bankruptcy and Crime. And a 2006 Pew Research Center survey found that 70% of Americans say that legalized gambling encourages people to gamble more than they can afford. (4) And please consider that 90% of casino profits come from 10% of the gamblers - which means that out-of-control gamblers are the profit center for the casino trade. (5) Greater accessibility of predatory gambling products leads to increased addiction and this inevitably hurts families, children and communities. Research has also shown that for every dollar gambling brings the government in revenue, three dollars must be spent on increased expenses related to crime and public assistance programs. (10) That’s not a pay-off the people of Florida can afford. None of us want to see Florida lose its treasured position as a family-friendly state with safe and growing communities. I urge the committee to reject the proposed expansion of predatory gambling that a Seminole Compact would bring. (6) SMR Research Corporation, "The Personal Bankruptcy Crisis, 1997: Demographics, Causes, Implications, & Solutions," Hackettstown, N.J., 1997, pp.116-130.